Ado Vabbe was one of the most innovative artists in Estonian art from the 1910’s to the end of the 1920’s, whose name is among other things associated with the advent of futurism, cubo-futurism and expressionism. Vabbe’s abstract works are also known. 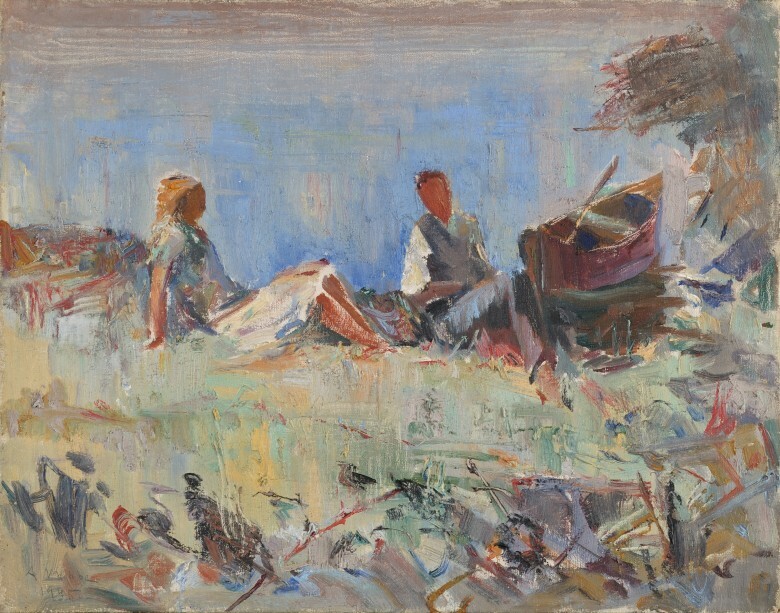 Studying and working in Germany and Russia in his youth, he arrived back in Estonia in the latter half of the 1910’s, where he worked as a teacher for decades at different art schools, including Pallas. His significance in Estonian culture is founded on his avant-garde work, for which reason innovative cultural groupings maintained close contact with Vabbe until the early 1920’s. Vabbe’s style changed in the mid-1920’s. He withdrew from active life in art and continued working as an art teacher. Henceforth he painted impressionist works inspired by natural settings. In the 1940’s, Vabbe was subjected to persecution by the Soviet regime that occupied Estonia and for some time he lived in true destitution. Beginning in the 1950’s, however, his former position was gradually restored. Regardless of this, Vabbe never became a widely and officially accepted artist during the Soviet era. This painting is extremely interesting in Ado Vabbe’s creative career. 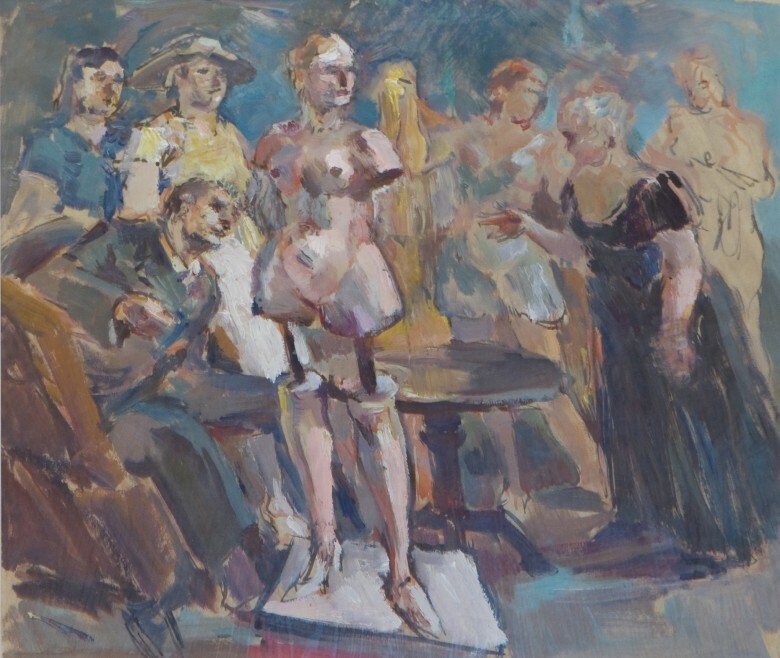 On the one hand, he uses several of the traits characteristic of his avant garde works – the generalisation of the figures, dynamic drawing, the endlessness and improvisational quality of colour surfaces, abstract images in the upper left hand corner, etc. On the other hand, the archaic farm buildings and the blue, black and white colouring form a very traditional background that even conveys conservative meanings. The combination of these two phenomena, the adaptation of his international avant garde experience to the motifs of his Estonian homeland, reveals two sides of Vabbe’s creative work. 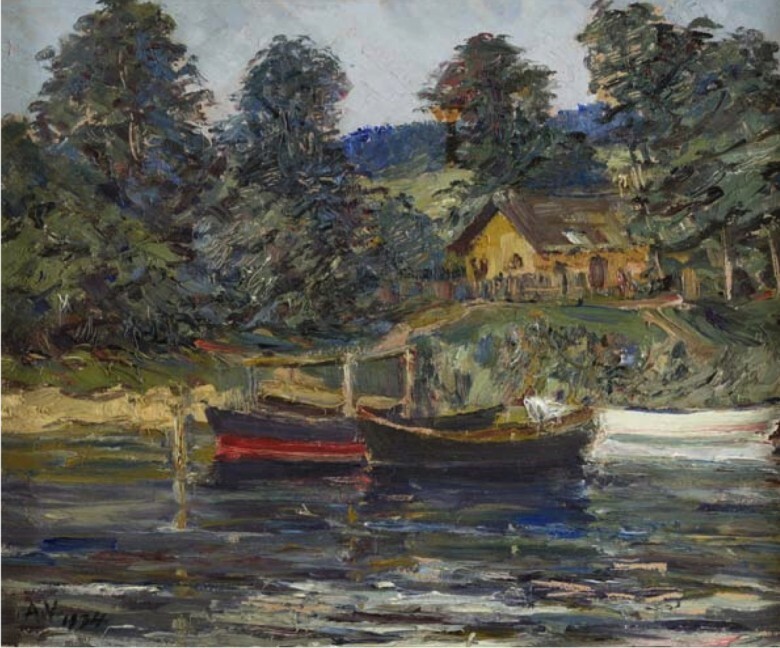 In his youth, Vabbe had been the number one avant garde artist in Estonia, who later started painting primarily realistic landscapes and figurative paintings. Ado Vabbe was one of the most important Estonian avant-garde artists in the 1910’s and 1920’s. Futurism, expressionism, constructivism, and so on set the fashion in his creative work. Ado Vabbe was in his 30’s, in other words at the height of his creative powers at the beginning of the 1930’s. Yet it is right then that he withdrew from artistic life and participated rarely in exhibitions. The reason for this is thought to have been primarily the notion that he was fed up with the politics of the art world, but also that he entertained doubts concerning his new style of painting. Namely, Vabbe turned to an altogether more realistic approach in the 1930’s. The reason for this is thought to be a certain weariness of avant-garde that had taken place throughout the world. Little is known of Vabbe’s work from the former half of the 1930’s even though according to the recollections of his contemporaries, Vabbe continued to work diligently regardless of not participating in exhibitions. Landscape was not a frequent subject in Vabbe’s earlier work, even though he expresses longing for nature in his letters from Paris to friends. Nature themes nevertheless became quite frequent later in Vabbe’s work. This work belongs to the same period as "War Refugees". The period of the Second World War was complicated for Estonia: different occupations alternated, a mass deportation took place, to say nothing of arrests, killings and mobilisations. Everyday subjects and their cheerful depiction, however, set the fashion during that period in Estonia. It was one way of ignoring the horrors taking place in society and providing viewers with experiences to make them forget everything that was appalling. "Mannequin" also does not refer at all to the social conditions that prevailed at that time, turning instead to a timeless and even somewhat absurd theme and pointedly directing its attention to the aesthetic, meaning non-political values of the work. In the Waiting Room was probably completed during the war years or immediately after the war, when Ado Vabbe completed a whole series of paintings borne of the same spirit, including the namesake of this painting In the Waiting Room (50.5 x 51 cm), but also War Refugees (1944-1950), Passengers on a Ship (1946), Passenger Car Compartment (1946), At the Ticket Booth (1944-1950), and others. A certain readiness to depart and at the same time staying put and waiting glimmers through all of these works. 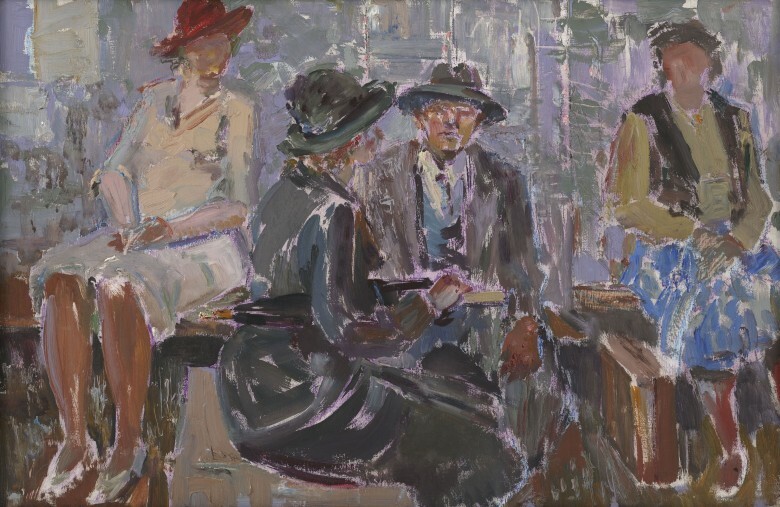 Other paintings from that time also have similar titles, for instance People Waiting (1943) by Karin Luts, and several sketches for the triptych People Waiting by Johannes Võerahansu (1941-1942), and others. This is easy to explain on the one hand by the context of the period, since departing from the Estonian homeland or at least the wish to go abroad was common. 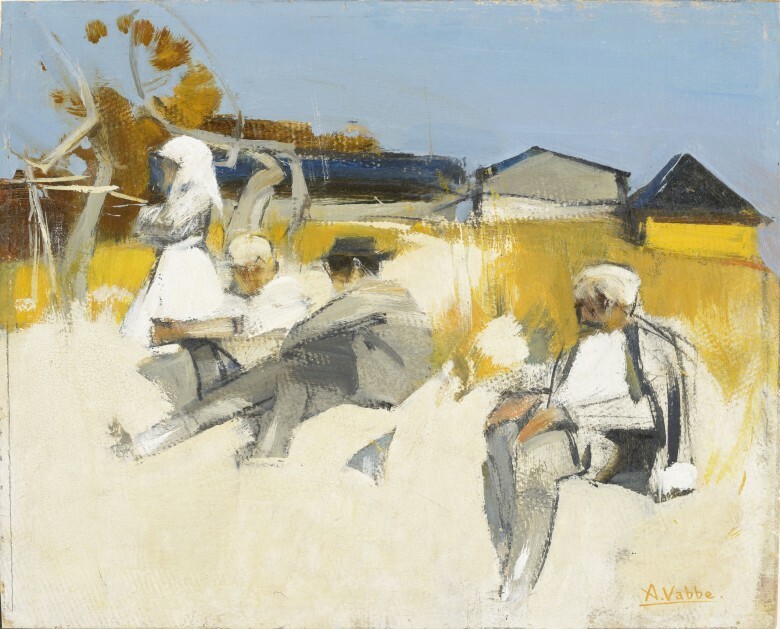 On the other hand, here Ado Vabbe’s wish to leave the country can be seen as arising from his personal tragedy (the death of his wife, the destruction of his studio and paintings, etc. ), whereas in his case this would not have meant an anonymous departure but rather a return to countries where he had lived at length in the 1910’s and 1920’s. In the mid-1940’s he painted several paintings, the titles and motifs of which originated from countries that he was thereafter never able to visit anymore (for instance Spain). Ado Vabbe completed about 70-90 paintings in 1941-1950. Figurally relatively realistic compositions completed with scant colouring are characteristic of Vabbe’s creative work from the 1940’s. "War Refugees" was also probably completed during the war years or immediately after the war. Like many people, Vabbe personally experienced fleeing from war. During the last years of the war, he had to change his lodgings many times with his little son. The fact that the men depicted in the painting are in German uniforms adds controversy to the subject, for which reason the exposition of the exhibition was impossible during the Soviet era and thus the work is also unsigned. "War Refugees" is painted on paper, which can be accounted for by difficulties in obtaining more expensive base materials as well as by the fact that the improvisational nature of Vabbe’s creative style also contributed significantly to such a choice. 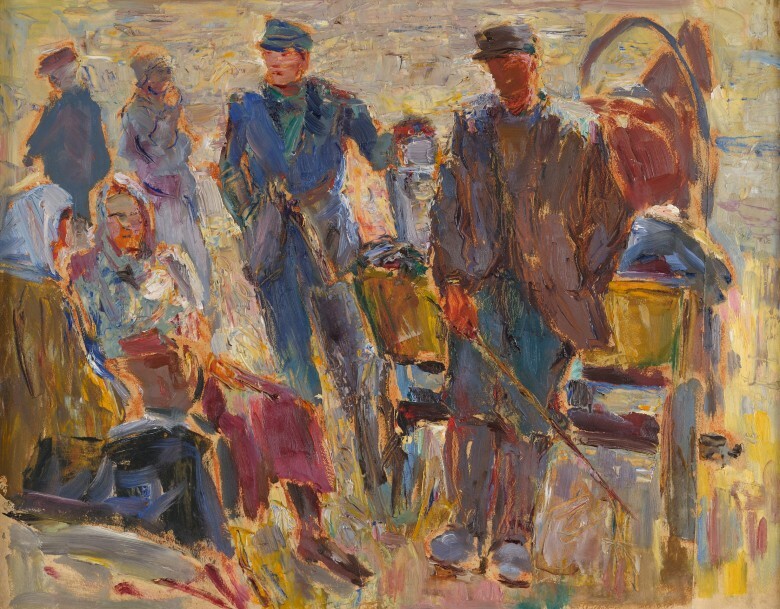 Since Vabbe painted even less frequently after 1947, "War Refugees" could probably be dated more appropriately in the interval 1944-1947.